Do guys notices what girls wear? Do guys notice how some girl look nice while others look lazy? Do guy take that in account when they like a girl or from affair? Of course. It's one of the reasons why there are so many greater varieties and styles of girls clothes and accessories. And the media plays a role. Guys look at your clothes. When something you're wearing catches a guy's attention he will examine it closely. iv always wondered this, but i think they see it as a whole while we notice the details. aw damn i saw the PERFECT pic for this... hmm wait. lol! ok i know it's a bit exaggerated but the point is, we are much more detail oriented. That's true: I would notice if it was an overall fresh look or if looked like a turn-off. If a girl walks by and wears "just a jeans" and "just a sweater" she may more or less go unnoticed. Girls are really specific with colors then to know the exact numbers. Yes I do notice what women wear. Especially if she is wearing my two favourite types of pants that I like a girl to wear which are tight jeans or tight faux leather pants. If there is a brand name on them I will notice that to. 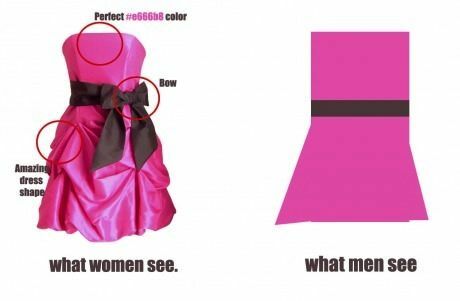 I notice what girls wear a lot. I notice women's shoes as well as all the clothes she is wearing to. We honestly don't analyze it as much as girls do. "Ew that girl is wearing ___ brand". If she looks good, it doesn't matter what the hell she's wearing. I notice how women look in certain clothes, but not the clothes themselves, if that makes any sense. I don't, not really. I notice I pay more attention to it in the summer/spring than in the fall/winter. Yes, I do notice what women are wearing. Home > Fashion & Beauty > Do guys notices what girls wear?